ICZI small 5 in 2 (usb 3.0 / usb 3.0 to type c adapter) hub with 2* usb 3.0 ports,Ethernet ,SD/TF card reader . Driver: the computer above the Windows 8 configuration does not need to be installed. The computer below Windows 8 needs to contact us to get the driver and install it. 2* usb 3.0 port: the maximum transmission speed is 5gbps;Can connect charging cable to charge the mobile phone, can also connect mouse, keyboard and so on; SD/TF: the speed of reading data is 480mbps, which meets the normal reading speed.They can be used at the same time. LAN interface: 100 megabytes can meet the normal use requirements;It can solve the problem that the computer has no net.When the hub connects the network cable, it will not affect the computer wifi. However, if the computer's wifi cannot be used, it may be the setting of the computer. Please feel free to contact us! 2. There is a non-slip mat at the bottom, which will not move easily. 3. There is a small indicator light on the Hub to check whether the connection with the computer is successful. 4. The Hub can also be connected to the phone to read the SD/TF data. 5. With a nice black velvet bag, if you don't want a carton, you can carry it with it. 6. Small size, can be used in school, home, office and travel. It is recommended to connect the hub to your computer before connecting devices to the hub. MacBook Pro, MacBook, iMac 2017, Google Chromebook, Google Pixelbook, HP Spectre X360, Lenovo Yoga 900 & 910, Dell XPS 12/13/15, Dell Alienware 13/15/17 and the Dell Precision 15/17, Lumia 950/950XL (up to 720p resolution); Samsung Galaxy S8/Note 8/S9, Huawei Mate 10 and so on. 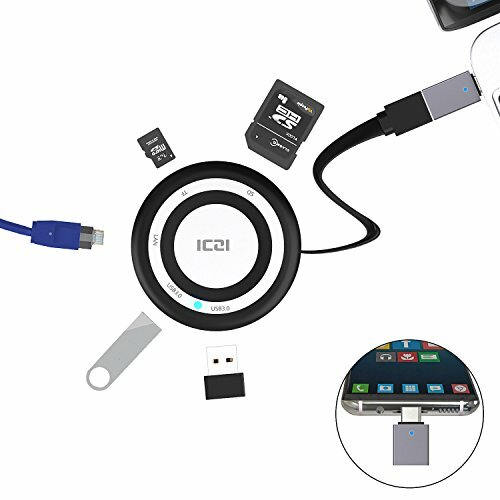 5 in 1 Multiplied Hub: ICZI round hub turns USB 3.0 port into Gigabit Ethernet port, SD and TF card Reader , 2 USB 3.0 ports for data transfer, internet connection, and charging.And equipped with usb 3.0 to usb c adapter as an interface replacement. Fast Data Transfer and Charging : 2 USB 3.0 ports support data transfer rates up to 5Gbps, SD and TF card slots (USB 2.0) support 480Mbps. Allow you to quickly upload and download photos, videos, music and other files. Connect to your external storage, keyboard, mouse, headset, optical drive, and more. Unique Design: the hub has a magnet that can be attached usb 3.0 interface.It will be more convenient to carry and used in school, company, home and travel.Type c to USB 3.0 adapter also can be used alone, charging and data transfer. Equipped with usb c to usb 3.0 adapter: on the basis of a usb 3.0 interface, add the usb c adapter for interface, so you can connect two different interface computers.You can also connect to your phone to read information from SD/TF. Intimate Design: Add non-slip mat to stabilize the hub on your table, will not move freely, also protect the bottom; ICZI Gift Bag help you to save this hub, easy to carry.Support 30 days free return and 2-year worry-free Warranty. If you have any questions about this product by ICZI, contact us by completing and submitting the form below. If you are looking for a specif part number, please include it with your message. Molshine XQD 2.0 USB 3.0 Card Reader, Supperspeed Transfer Data, Flash Memory Card Reader Aluminum Alloy Material, Suitable for Nikon D4/D5/D500, Sony XQD Interface and Other Pickup Camera Type.